SINGAPORE - The National University of Singapore (NUS) and Nanyang Technological University (NTU) have leapt into the top 13 of the annual World University Rankings, partly due to a change in how research citation is evaluated. In the ranking by London-based education consultancy Quacquarelli Symonds (QS) released this morning, NUS took the 12th spot this year, up from 22nd last year, and NTU was placed 13th, up from 39th last year. The Massachusetts Institute of Technology topped the list, closely followed by Harvard. The University of Cambridge tied with Stanford University in third place. QS said it had changed the way research citation is taken into account, to correct the bias created by a large volume of citation generated by publications in some fields, such as life sciences and medicine. QS head of research Ben Sowter said: "For example, the medical sciences account for 49 per cent of the citations in Scopus, the world's largest citation database. Note: Last year's rank is in brackets. "In contrast, the arts and humanities produce only 1 per cent of citations, because of their very different publishing culture." With the change, research citation in five areas - life sciences and medicine, arts and humanities, engineering and technology, social sciences and management, and natural sciences - are given equal weighting of 20 per cent. Mr Sowter said the new methodology "now evens the playing field". But even without this change, NUS and NTU would have improved on their rankings this year, he said. "NUS has been steadily climbing various league tables for years, and has done so while developing excellence across the academic spectrum. "It is that balanced approach that has led to a research profile that is not disproportionately geared towards medicine. This has been revealed with dramatic clarity in this year's QS World University Rankings," he added. NUS ranked ninth globally in the academic and employers reputation criteria and made it to the global top 10 in three faculty areas. NUS president Tan Chorh Chuan said the university needs to review the change in methodology to understand how it has resulted in the changes in ranking this year. He added: "Our consistent performance in international rankings is a reflection of Singapore's strong support for higher education, as well as NUS' strong focus on talent and excellence. We are also pleased to note that NUS continues to be highly regarded and valued by academics and employers worldwide." On top of a significant improvement in research citation, NTU also fared better in terms of academic reputation and faculty-student ratio. Its ascent would have still been remarkable without the change to the research-citation parameter, Mr Sowter said. 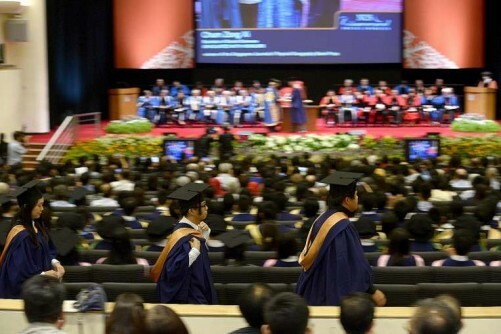 "If QS had continued with the previous approach, NTU would still have gained more than 10 places from last year, underlining its genuine transformation into a world- class university over the past decade," he added. NTU president Bertil Andersson said the achievement is clear recognition that NTU's investment and efforts to build up its academic and research excellence have paid off. He said NTU has been successful in attracting top talents, including promising young international scientists. "Our faculty has been producing world-class impactful research," he said, adding: "It is remarkable that the two Singapore universities, NTU and NUS, are both ranked within the global top 15. This is a fantastic birthday gift for this young nation on its Golden Jubilee."